Dolomite is a carbonate mineral which includes iron dolomite and manganese dolomite. After crushing process, it can be used for building materials, ceramics, glass, refractories, chemicals and agriculture, environmental protection, energy conservation and other fields. It is mainly used as basic refractories and blast furnace flux, also used for producing calcium magnesium phosphate, magnesium sulfate and the glass and ceramic ingredients. Various dolomite products: dolomite ore, dolomite sand of 6-10 mesh, 10-20 mesh, 20-40 mesh, 40-80 mesh, 80-120 mesh, dolomite superfine powder of 140 mesh, 200 mesh, 325 mesh, 600 mesh, 1000 mesh, 1600 mesh. 200 mesh is the standard fineness of dolomite grinding. The output size of Raymond mill, LM vertical mill, European type trapezium mill can be adjusted between 80-425 mesh, it can be separated to meet the needs of 200 mesh powder. More details about dolomite, welcome to consult! 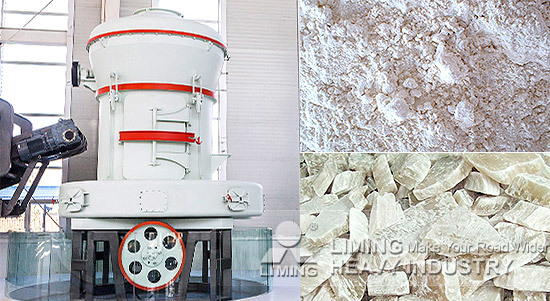 <<Previous：Which grinding mill has better effect for bentonite processing?